Hotel Transylvania is a deviation from our normal Halloween reviews in that it is not a horror movie, but a comedy using horror tropes. 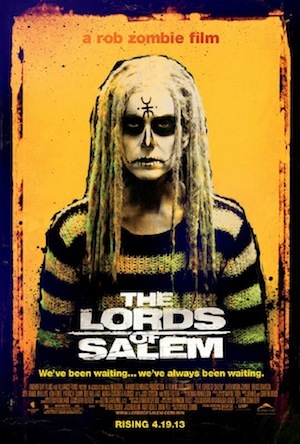 However, I expect it to become a Halloween movie staple in the years to come. The basic premise of Hotel Transylvania is a bit silly; after losing his wife to an angry mob, Count Dracula (Adam Sandler) is left to raise their daughter alone. He builds a five star hotel to serve as both a refuge for the world’s monsters from the human world and a safe haven in which to raise his daughter Mavis (Selena Gomez). On Mavis’ 118th birthday Dracula holds a huge party with all the monsters coming to celebrate. These include Dracula’s best friends Frankenstein (Kevin James) and his wife Eunice (Fran Drescher), Wayne Werewolf (Steve Buscemi), His wife Wanda (Molly Shannon), and their horde of children, Murray the mummy (CeeLo Green), and Griffin the Invisible Man (David Spade). Two things complicate Dracula’s plans for the event. One is that Mavis is tired of being confined to the hotel and wants to explore the world. The other is that a human, Johnny (Andy Samberg), has stumbled upon the hotel. Dracula needs to keep the monsters from finding out Johnny is human or they will flee the hotel in terror. Adding additional stress is that Mavis is attracted to Johnny. Disguising Johnny as a monster, Dracula tries to find a way to safely get him out of the hotel, deal with Mavis’ wish to spread her wings, and keep his hotel a safe home for the monsters. On the surface, Hotel Transylvania is a concept that should not work. It is an animated horror comedy starring Adam Sandler. But it does work. A lot of the credit goes to the script writers (Peter Baynham and Robert Smigel) but the most credit goes to the director (Genndy Tartakovsky, who worked on Powerpuff Girls and created Dexter’s Laboratory and Samurai Jack). 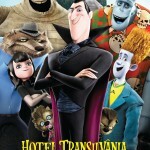 Hotel Transylvania is a very fast paced and kinetic movie, but does slow down for some well-done emotional scenes. There is never a scene that drags. The character designs are expressive and inviting, even when they are monstrous. Many of the character designs bear a resemblance to the voice actors playing them. On the voice acting front there is not a single dud amongst them. Having a cast of comedy veterans and SNL alumni was an excellent decision. Sandler stands out in this group, not only as the main character, but doing some of the best work of his career, even if there is an occasional accent slippage. Music also plays an important role in the film, even with it not being a musical. There are several occasions where characters, especially Johnny, are performing as part of Mavis’ birthday. The music in the film is done by Mark Mothersbaugh (of Devo) and works well in the film, even if it is not particularly memorable. 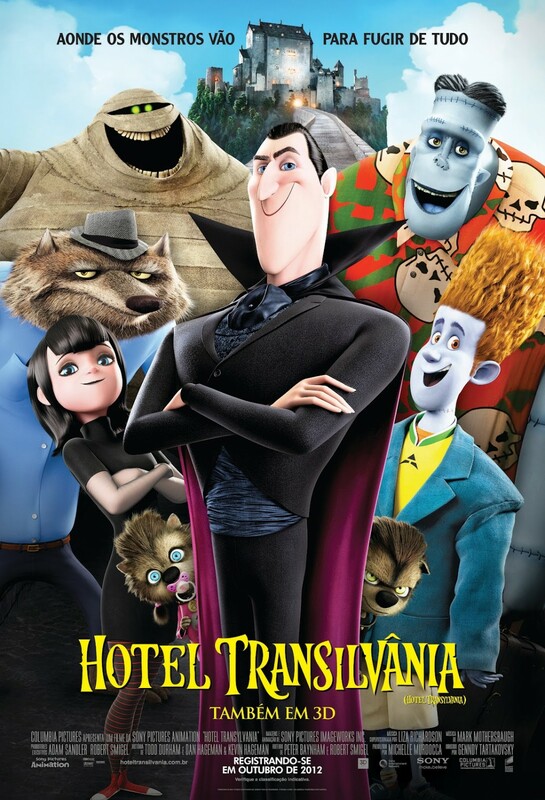 Hotel Transylvania is a charming movie that can easily be enjoyed by both children and adults. I give Hotel Transylvania a grade of B. Genre fans should enjoy it, and even non-fans should be ok with watching it with their kids. Side note: This year my five year old god daughter has decided to be Mavis for Halloween, and so the whole family is going as characters from the film. She decided I would be Frankenstein, and who am I to argue with a determined five year old on Halloween. It’s time, once again, for our annual Halloween celebration, where everything on the site relates to Halloween or horror for the month of October. 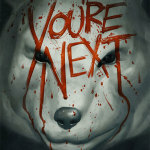 And let’s kick things off with one of the hidden gems of horror films, You’re Next. 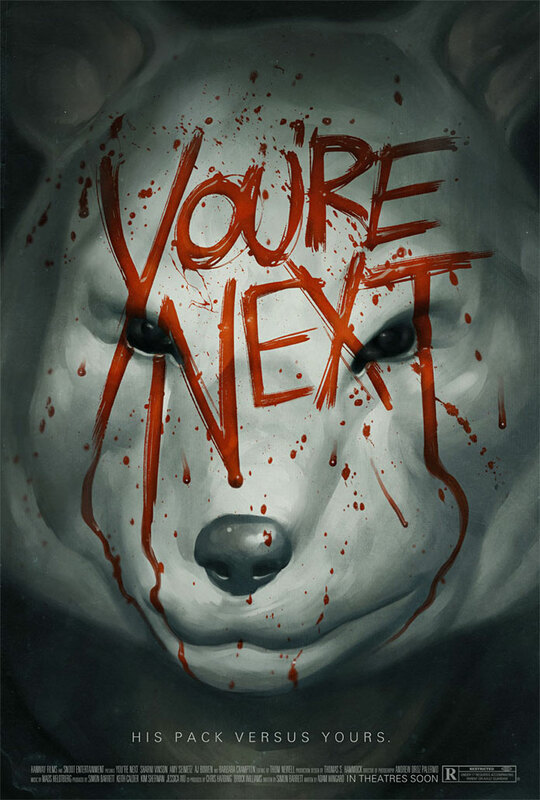 You’re Next is from the team of director Adam Wingard and writer Simon Barrett, and is part of the mumblegore subgenre, which strives for naturalism in both performance and dialogue. The plot set up plays like a lot of standard home invasion films; the main characters are in their isolated home when masked intruders suddenly attack and start killing them off. But unlike most of the films in this genre, there is a significant twist (which I am loathe to spoil) that makes this film stand out from other home invasion films. This film did not do as well in the box office as it deserved. Once again we have a film let down by its marketing campaign (or as I like to call it, the John Carter Syndrome) it was marketed as a standard home invasion film, with no hint of the twist. And while that makes a certain amount of sense, it is the twist that makes the film worthwhile. I will say this much about it, by the half-way point of the film the invaders are every bit as terrified as the remaining victims. There is also a very significant focus on the family dynamic at play. The set-up has Paul and Aubrey Davidson hosting a family reunion, in honor of Paul’s birthday, at their vacation house with their adult children. The four children bring their significant others. During dinner on the first night, the bickering and passive-aggressive attacks on each other get so bad that when the first murder happens it comes as a relief. Wingard sets a great mood by having the family feel trapped, long before the attacks, and giving an increasing sense of claustrophobia as events spiral on. Sharni Vinson gives a stand-out performance as Erin, the girlfriend of the oldest son Crispian (A.J. Bowen). Erin has a childhood trauma she is trying to get past that informs how she deals with the attack. Her performance forms the through-line of the movie. Another pair of performances that are noteworthy are Nicholas Tucci and Wendy Glenn as middle son Felix and his girlfriend Zee. They are the source of much of the family discord, and this comes into play as the attack commences. One other performance worth pointing out is Barbara Crampton as Aubrey. Crampton is a former Scream Queen, best known as the female lead in Re-Animator. Aubrey’s goal is to have a happy family gathering, and her pain from this not happening is clear even before the attacks begin. One particularly nice touch is that the entire sound track is variations of the song “Looking for the Magic” by the Dwight Twilley Band. I give You’re Next a grade of B on the Fanboy News Network Scale. Horror fans should really enjoy the twist on the clichéd Home Invasion story and non-fans should like it for how the twist is carried out. I feel like I came a bit late to The Thrilling Adventure Hour party. I had heard of the show, or at least that there was a show, for about a year. What I hadn’t heard was what it was about. Back in January when I went to the see the Welcome to Night Vale live show, it was announced that they would be back in Seattle in March for Emerald City Comicon, and to do a cross-over with The Thrilling Adventure Hour. So with that announcement I decided it was time that I find out what The Thrilling Adventure Hour was all about. And once I did, I was more excited about them coming to town then Welcome to Night Vale. In short, The Thrilling Adventure Hour is a monthly live show performed at the Largo at the Coronet, a 250 seat theater in Hollywood. It is a show done in the style of old time radio, with the performers standing on stage with scripts in hand and with sound effects added live. Segments of the show are then released weekly, as a podcast by Nerdist Industries. The show was created in 2005 by Ben Acker and Ben Blacker, when they were developing an animated show to pitch. They liked how the read through sounded, and it inspired them to attempt the old style radio format. A typical live show is broken into three segments, two regular ones and a rotating middle segment. The segments are often broken up by ads for fictitious product brands. So, from this basic format what was it that made me get really excited about this show? The simple answer would be everything, so let’s get down to specifics. First is the writing; Acker and Blacker are amazingly talented writers, who found a format that lets them cut loose. The scripts are well plotted and paced with an emphasis on the dialog between characters. Also, you can clearly tell the characters apart just by the dialog, which comes in handy when different actors sometimes have to step in to play an already established character. On top of that you have an embarrassment of riches in the actors. The core performers of The Thrilling Adventure Hour are known as the Workjuice Players. They were formed initially from improv actors associated with Second City, and grew to include some of the regular guest stars. The current roster of the Workjuice players is Paget Brewster, Craig Cackowski, John DiMaggio, John Ennis, Mark Gagliardi, Marc Evan Jackson, Hal Lublin, Joshua Malina, Busy Philipps, Autumn Reeser, Annie Savage, Paul F. Tomkins, and James Urbaniak. Additionally, you have the show’s director Aaron Ginsburg, and Musical Director Andy Paley. On top of the core players, the show has had an amazing array of guest performers. Nathan Fillion has appeared so often he has his own reoccurring segment. His Castle co-star Molly Quinn also has a reoccurring character. It would be insane to try and cover all the other guest stars, but examples include Weird Al Yankovich, Jon Hamm, Zachary Levi, Karen Gillian, and Clark Gregg. Part of what attracts such notable guests is that the format requires no memorization, so prep time is minimal. Guest starring on the show has become such a big deal that many of the Workjuice players have said they are glad they got in early, as they are not famous enough to warrant a guest spot now. It is a formula that works. The monthly live show regularly sells out. And they have regular attendees, as well as people coming to see the show after listening to the podcast. The live nature gives it an energy you just can’t get in a recording booth. As for the show itself, you can tell that the fans are fully invested because they cheer loudly when familiar segments start. And about those segments. They cover a wide range of genres, with the unifying factor of almost all of them being funny. And what are those segments? The live show traditionally starts with Sparks Nevada, Marshal on Mars. This was the original show that Acker and Blacker were writing as an animated pilot. It is literally a space western, telling the story of Sparks Nevada (Marc Even Jackson), a man from Earth in the 31st century who is the Marshal on Mars. He is aided by Martian native Croach the Tracker (Mark Gagliardi) who accompanies him to fulfill an onus owed to Nevada by his people. This is the one segment that is serialized and needs to be listened to in release order to follow the story. It also has several spin off segments that fit into its continuity, but I’ll get to them in a bit. The last segment in the live show is Beyond Belief. This follows the adventures of Frank and Sadie Doyle (Paul F. Tompkins and Paget Brewster), a couple who get involved in various supernatural situations. They are pastiches of Nick and Nora Charles from the Thin Man movies. As such they are drinking constantly, and would prefer to be left alone, but always end up helping whoever comes to them for help. The middle segments of the show rotate each month. First you have what has become known as the “Sparks Nevada extended universe.” These are stories set in the Sparks Nevada continuity but do not usually feature Sparks himself. The most common of these is Cactoid Jim, King of the Martian Frontier featuring Nathan Fillion as the title character, a cross between Davy Crockett and Buck Rogers. Next is The Adventures of Captain Laserbeam, starring John DiMaggio as a Silver Age style superhero. In later episodes it also features Phillip Fathom, Deep Sea Detective (Hal Lublin), who is basically an aquatic version of the Nolan Batman. Down in Moonshine Holler follows the exploits of a depression era millionaire (Craig Cackowski) who abandons his old life to become a Hobo, as he searches for his love The Hobo Princess. The Cross-Time Adventures of Colonel Tick-Tock features a Victorian gentleman (Craig Cackowski) who protects the timeline on behalf of Queen Victoria. It has a spin off in The Algonquin Four, where members of the Algonquin Round Table gain the powers of the Fantastic Four. Tangentially related to Tick-Tock is Amelia Earhart, Fearless Flyer, where the famed pilot faked her disappearance in order to fight time traveling Nazis across history. The show also has a completed series called Tales from the Black Lagoon, featuring Mark Gagliardi as Ben Chapman, the actor who played the Creature from the Black Lagoon. The story is a Noir alternate history of Hollywood, and the only segment to not play up comedy. There are also various one or two shot segments that occur from time to time. All segments, with the occasional exception, are narrated by Hal Lublin. One of the strengths of the show is that it avoids the common comedy trope of the hero being an incompetent idiot who wins through the luck that comes from the efforts of others. Rather, it mines its comedy from dialog, relationships, and the situations the characters find themselves in. An example is Sparks Nevada, who is very blasé about everything and a bit egotistical. However, in a crisis his blasé attitude translates into a lack of panic, and his ego gives him confidence in his skills. The humor is usually about his relationship with Croach, or their mutual love interest The Red Plains Rider (Busy Phillips) and how issues involving these come up at the worst possible times. I give The Thrilling Adventure Hour a grade of A-. Genre fans will love it and non-fans should enjoy most of it. The only reason it gets the minus is not everyone will enjoy every single segment. Midnight Ballad for Ghost Theater is a 2006 Korean film that is very hard to categorize. 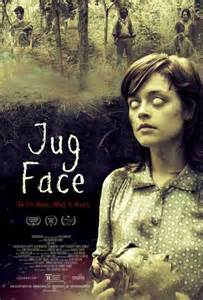 Let’s call it a musical comedy that utilizes horror themes. It is hard to find, as it has never had an official American release; however, it is possible to order a copy from Korea. The plot revolves around Seong Sodan (played by Kkobbi Kim), a teen age girl who lives with her Grandmother. One night her grandmother leaves the house, saying she is going to the theater to watch a movie she starred in when she was Sodan’s age. Sodan tracks down the theater to find her grandmother, but no one has seen her. Interrupting a suicide attempt by the theater manager (played by Chun Ho-jin), she is given a job as ticket seller, where she hopes that eventually her grandmother will show up. It turns out that the theater is haunted by the ghosts of the rest of the theater troop who made the film with Sodan’s grandmother. They are doomed to haunt the theater until they can see that film, (“Minosoo: The Bull-headed Man”) once again. At first frightened of the ghosts, Sodan befriends them and they help her come out of her shell. She, in turn, tries to find out what happened to the film, both to help her new friends and hopefully to find her grandmother. All the while, the theater manager tries to dissuade her (between his botched suicide attempts), saying that finding the film will lead to tragedy. If I had to sum up this movie in one word, it would be charming. 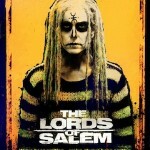 The overall feel of the film has a clear Tim Burton-esque feel to it, mainly of his earlier films like BeetleJuice. There is a sense of “what the hell am I watching”, while still enjoying the ghost’s antics. The characters of the ghosts themselves are immediately engaging. First we have Elisa (played by Joon-myeon Park), who claims to be a Joseon Dynasty Princess. She is loud, bossy, and often threatens to execute the others. Next is Hiroshi (played by Jo Hie-Bong), a Japanese solider who was stationed in Korea where he fell in love. All of his dialogue is in Japanese, but he can understand Korean, and still be understood by the other ghosts. Wanda (played by Ae-Ri Han) is a former Kisaeng (similar to a Geisha), who fell out of favor after giving birth to a client’s child. She is bulimic and obsessively counts her hair. Finally you have Mosquito (played by Yeong-su Park), who is made-up like a demented Harlequin (or let’s be honest, the Crow). Of all the ghosts, he is the only one who is given no back story. The theater manager is clearly involved with the ghosts’ story, and as Sodan unravels the mystery of the missing film, she learns more of what that is. All the back story of the ghosts, the manager, and the film itself are done though song. And those songs can be very catchy, even for someone who does not speak Korean. If you are looking for deep character analysis, Midnight Ballad for Ghost Theater is not the movie you want. It is a light hearted romp, with no real concern for character development. I give Midnight Ballad for Ghost Theater a B-. It is appealing, and fans of films like BeetleJuice or The Rocky Horror Picture Show will enjoy it and possibly want to own it. Non-fans will likely be left lukewarm by its surreal nature and lack of character depth. escape, yet when the end comes you understand the choices she makes. completely stands out. But, as soon as the story starts, things go downhill. 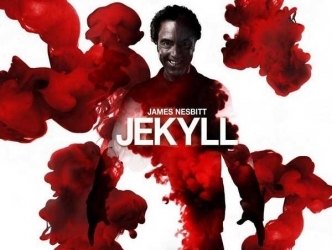 Jekyll is a 2007 six episode BBC miniseries written and produced by Doctor Who writer, and current show producer, Steven Moffet. It was his first take at doing a modern interpretation of a classic Victorian character, which he of course followed up on, 3 years later, with Sherlock. The series follows Dr. Tom Jackman, a successful research scientist, who inexplicably starts transforming into another persona, complete with physical changes. Fearing the violent behavior of the other persona, Jackman leaves his family, quits his job, and sets up an apartment where he can try to unravel what exactly is happening. With the help of recordings and surveillance equipment, the two personalities are able to communicate enough to come to an arrangement that basically equates to a time share agreement on their body. To facilitate this, they hire a psychiatric nurse named Kathryn to act as an impartial aid to both of them. Once the other personality learns about the book The Strange case of Dr. Jekyll and Mr. Hyde he adopts the name Billy Hyde. 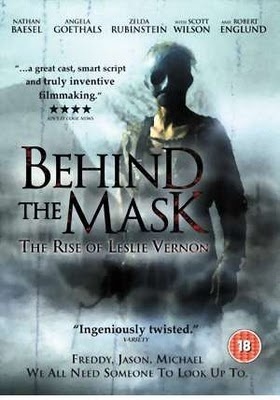 Additional complications to the arrangement include: Jackman wanting to keep the existence of his wife and twin sons from Hyde, fearing he might harm them; his wife hiring an investigator to try and learn why he left his family; his old employer, and friend, wanting to know the same; and why a mysterious organization is now following him, claiming to be Hyde’s owners. And all that is just part of the first episode. Jekyll is a smart series that uses its set up to explore several questions. Of course you have the concept of duality, as you always will with the Jekyll and Hyde story. You also have a recurrent question through the series, is Hyde actually evil, or is there more to him? And like the original story, the heart of it is the mystery: why is Jackman transforming in the first place? Two things make this series really stand out; the smart script by Moffet, and the acting. Moffet does not fall into the easy clichés of the traditional interpretations of the characters, but instead looks at them from a more layered perspective. The horror comes from the idea of Jackman not being in control and Hyde possibly hurting his family. Several tense scenes are based on Jackman waking up from being Hyde, at least once covered in blood, and having to piece together what Hyde has done, fearing the worst. There is also the dread that Hyde is taking over and one day will not turn back into Jackman. From the acting side, any show like this is going to live or die by the lead actor, and how he handles the dual role. 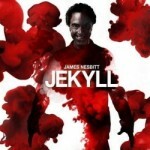 Fortunately Jekyll had the good fortune to cast James Nesbitt as Jackman/Hyde. Non-UK readers will know Nesbitt primarily as Bofur in The Hobbit movie. The challenge is making Jackman and Hyde distinct characters. It would be one thing to just play Hyde as completely over the top, and while he is at times, there is more to the character than that and Nesbitt makes that clear. The makeup for Hyde is subtle, just enough that he is recognizably different but can still be mistaken for Jackman at first glance. Nesbitt manages different body language and vocal styles for the two characters, and it is clear which is which even if he is far away enough that you can’t see the makeup. Another stand-out, in the impressive cast, is Gina Bellman as Jackman’s wife, Claire. Audiences will recognize her as Jane from Moffat’s sitcom Coupling, as well as being the grifter Sophie on the TNT series Leverage. Claire has an impressive arc, as she struggles to deal with her husband abandoning his family and her growing realization of what is happening to him. Her story arc is as central to the show as is Tom/ Billy’s. Other notable cast members include: Denis Lawson (who was Wedge in the Star Wars films) as Jackman’s friend and former boss, Michelle Ryan (who was Jaime Summers in the brief Bionic Woman reboot) as the nurse Jackman and Hyde hire to help facilitate their arrangement, and Paterson Joseph (the Marquis de Carabas from Neverwhere) as the mystery man claiming that his company owns Hyde. But for all the good things about Jeykll, there is one glaring problem, the final scene of the series. I’m not going to spoil it here, but everyone I have ever talked to about the series, who has seen it, agrees that the final scene is terrible, and makes several plot points in the series make no sense. And that it was not needed. You could have ended the series on the previous scene and had a satisfying end. Also the final scene basically ends as a sort of cliff hanger, and since there was no second series it leaves the story in limbo. I’m not sure why Moffet felt the need to include this particular plot point, other than perhaps he thought it was a cool idea, which it might have been if there had been more there to mitigate the plot holes it creates. Using the Fanboy News Network rating scale I give Jekyll a B+. It is a superior effort, but the last scene keeps it from getting an A.
Shutter is a horror film made in Thailand, in 2004. It is clearly inspired by the wave of horror films, coming predominately from Japan, that have come to be known as J-Horror. After a night out drinking with friends, our main characters Tun and Jane are driving home when their car hits a woman. Freaking out, Tun insists that they not get out of the car and just head home. After the accident Tun, who works as a photographer, starts finding strange images in the pictures he takes. This leads him, and Jane, to start learning about the phenomena of ghost photos. As the haunting escalates beyond the photos, invading their lives, Tun and Jane attempt to learn exactly whom they had hit, and what really happened. Things get more desperate when they learn that the friends with whom they had been out drinking have also been having strange encounters, and that two of them have died. As the mystery unfolds, we learn that there was more going on than a simple hit and run, and that the ghost may have an honest grievance against those she is targeting. 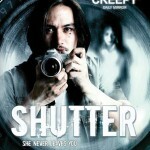 Shutter is a masterfully made horror film. The directing and writing team of Bangjong Pisanthankun and Parkpoom Wongpoom have a clear understanding of how to pace the film, which is where so many horror films fail. 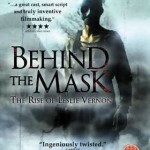 The tension is built expertly throughout the film and, unlike so many horror films, does not switch to action movie pacing during the third act. Their writing is also top notch. They set up a standard horror movie premise in the beginning, and then a series of twists wherein something else was going on all along. And while these twists are well done, they are not M. Night Shyamalan twists that happen at the end and seem to be the point of the whole movie. Instead they are well integrated into the script and make perfect sense once revealed. 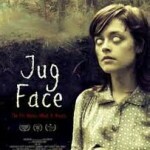 The movie also integrates elements of several horror traditions. Clearly the main one is typical of J-Horror, with the angry female spirit seeking vengeance. You also have elements of standard EC horror comic plots, with someone who has been wronged, coming back from the grave to wreak their own brand of justice. There are even nods to Hitchcock in the film. But most importantly, all of these are subtle and do not detract from the story itself. The acting is well done, especially by Ananda Everingham as Tun, and Natthaweeranuch Thongmee as Jane. Their reactions come off as authentic and believable. The one element that really struck me, while watching the movie, was the cinematography. This is a movie that has photography as a major theme, and thus color and composition are going to be key to making that seem realistic. Cinematographer Niramon Ross does a brilliant job with this work, making this an important part of the story telling. It also ends with one of the most powerful and haunting images I can remember in recent horror. I want to take a moment to talk about the jump scares. This is a pet peeve of mine in horror. I have nothing against a good jump scare; what I hate are false jump scares. The tension is built, the jump scare happens, and it turns out to be the cat, which then immediately leads to the actual jump scare. This never happens in Shutter. Each jump scare is legitimately the ghost. There are even some rapid succession jump scares, but they are still always the ghost. To me this shows that the directors knew what they were doing, and trusted their material. It is worth noting that Shutter has become a fairly influential film, with eight remakes (seven in other countries, including the U.S., and one in Thailand). 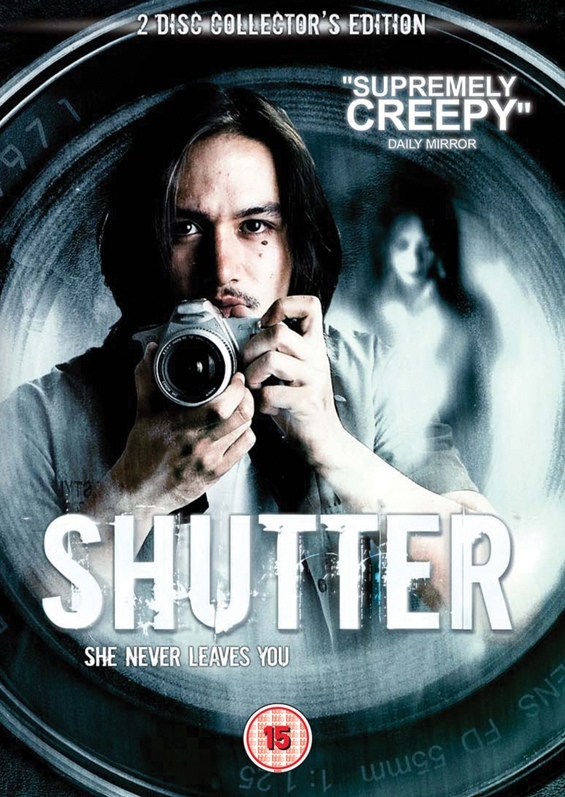 Using the Fanboy News Networking rating scale, I give Shutter a grade of B+. Horror fans will love it, and non-fans should at least feel that they did not waste their time. It is a must have for any horror fan’s DVD collection. 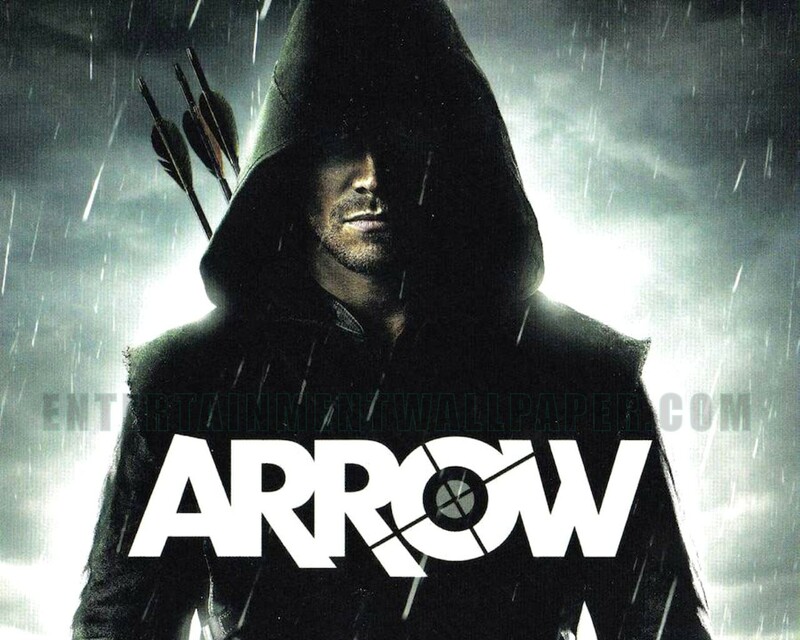 Back at the beginning of the season I did a review of Arrow, the CW’s take on DC Comics character Green Arrow. At the time of that review, the series had only aired five episodes. At the end of the review I promised to revisit the series at the end of the season. Well, the season has ended, so here we go. Go here to see what I said of if you haven’t already, as I am going to write this review with the assumption that you have read the previous one. I will not be avoiding spoilers either, so be warned. First, let’s see if any of my opinions changed between then and now. Back then I complained that Oliver Queen’s mother Moira, sister Thea, and best friend Tommy all suffered from underdevelopment compared to the rest of the characters. To varying degrees, all of them got better development as the season wore on. Thea got the least. She is still Oliver’s troubled little sister, seeming to follow the pattern he set in his life pre-island of party girl excess. But after a drug bust and near imprisonment she had to do community service at the Laurel’s law office. This led her to meet a street tough named Roy Harper and start a relationship. It got her out of self-obsessed territory and made her more than just window dressing. Moira got even more interesting. Her involvement with the villain of the story drove a lot of development, especially when it became clear that she was in over her head and just doing whatever she could to protect her family. This culminated in an attempt at redemption that was well played and should prove fodder for great drama next season. Tommy ended up getting the best development in the series other than Oliver. While sharing the name of Oliver’s arch-enemy from the comics, it turned out that the Dark Archer was actually his father. This led to plenty of speculation as to which side Tommy would eventually end up on. His arc was well played. Once his father cut him off from the family money, Tommy honestly grew as a character. He found a job working for Oliver at his night club, and started an honest relationship with Laurel. One of the interesting points of that relationship is that every time Tommy was presented with a challenge that might have lead him back to his insincere party boy ways, he instead made the right choice. It created great tension in that he was good for Laurel, thus adding complications to Oliver’s relationship with both. This got even more intense when Tommy learned that Oliver was the Hood, leading him to abandon both Oliver and Laurel. This led to the biggest twist in the finale when Tommy risked, and lost, his life to save Laurel, and reconciled with Oliver as he died. Since the last review there were five major characters introduced. Roy Harper, played by Colton Haynes, I have mentioned before, as he is Thea’s boyfriend. He is significant to comic fans, as in the books Roy is the first Speedy, Green Arrow’s sidekick who ended up as the hero Arsenal. Roy’s arc is that the Hood saved him and now Roy wants to find him and learn from him. Basically Roy feels called to do better with his life, and feels working with the Hood is the way. It was not a big arc, but a good set-up for one next season, especially with his actions in the finale. Roy is going to be promoted to series regular next season. Another character getting promoted to regular next season is Felicity Smoak, played by Emily Bett Rickards. Felicity is an odd addition, because in the comics she is a supporting character in Firestorm, not Green Arrow, but that is just a fanboy nitpick. At first I was annoyed by the fact that they had this obviously very attractive actress playing like she was an ugly duckling nerd. I had no problem with her being a nerd, but the way she acted was not matching how they had her look. Fortunately as the season progressed, she became more of a socially awkward and insecure character. She knew how she looked, but it was treated as another hindrance to what she loved to do. At first she was just someone that Oliver would come to when he needed some information that required computer skills. When he had to turn to her for help while wounded, she was not surprised, as she had deduced most of what was going on already. This makes her another example of not making smart characters act dumb for the sake of plot convenience. Since then she has been part of Oliver’s team. However, she brings a problem I like to call the “Chloe syndrome,” named for the character Chloe Sullivan from Smallville. This is where the lead character has more on-screen chemistry with a secondary character than the official love interest. In this case, Felicity has a lot more on-screen chemistry with Oliver than Laurel does. The third late addition is Tommy’s father Malcolm Merlyn, played by Torchwood star John Barrowman. 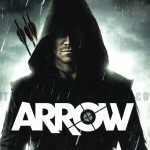 As stated earlier he took over the role of the Green Arrow’s arch-enemy, the Dark Archer. It was good to see Barrowman break type and play a villain, especially one with some sympathetic aspects. Malcolm was a well-intentioned extremist. Sadly he will not be back next season. The final newcomer is Slade Wilson, played by Manu Bennett. His character was teased from the first episode, as Slade in the comics is the villain Deathstroke, and we saw the Deathstroke mask in the first episode. His role is currently limited to flashbacks to Oliver’s time on the island. It was a good idea to bring on a new regular as part of the flashbacks if they are going to stay in use. It is also interesting to watch as Oliver and Slade are allies right now, but in the comic they are enemies. Of the remaining cast, Paul Blackthorn is about the same as he was early in the season as Detective Lance. His arc was a minor one, with him eventually coming to realize that the Hood was needed to save the city, and that maybe they could be allies. It was a slow build that took all season, and for the most part it works. The biggest disappointment is Katie Cassidy’s character Laurel, and in a lot of ways it isn’t her fault. While she did drive a certain amount of the plot, the writers put her in a bad spot. As a love interest for Tommy she worked great, showing his growth and making his final fate really hit home. As a love interest for Oliver she did not work as well. The two do have chemistry, but again it seems pale compared to the Oliver and Felicity. Add to that the fact that the writers have put just too many obstacles between them. But the worst part is that she just seems to be there as a motivation for Oliver, which is sad when you compare her to her comic book counterpart. David Ramsey as John Diggle, Oliver’s partner in crime fighting, got a good arc in the latter part of the season, the discovery that reoccurring villain Deadshot killed his brother, and Diggle’s thirst for revenge, which created tension in the Diggle/Queen partnership. This plot thread has not been resolved, so there is more to mine from it. Outside of that they maintained the intelligence and skill that was shown early in the season and portrayed that Diggle is not just a sidekick. And of course you have Stephen Amell as Oliver. Over the season, it is clear that he was a good find and perfect for the role of superhero. His athleticism has made his portrayal of Oliver all the more realistic. He also had two versions of the character at different times in his life, which has gone smoothly. The season finale showed him wounded and yet determined. Before looking at the show itself, we need to explore the Aquabats history. 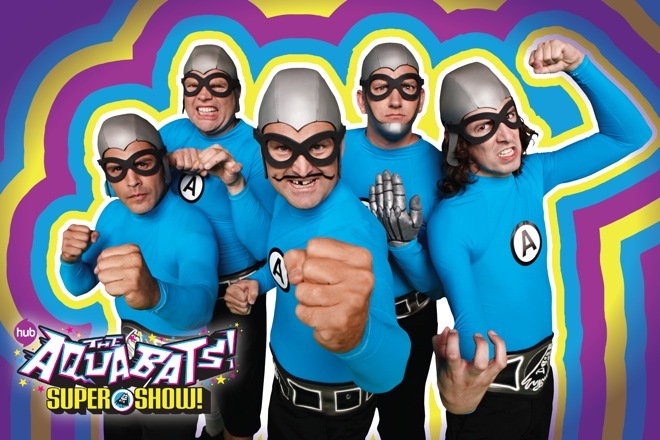 The Aquabats are a band that formed in 1994 in Orange County. Originally an eight member ska band, they evolved due to band changes to a rock band with punk, new wave, and ska influences. What really makes the band stand out is their stage act. Their concept is that they are a team of superheroes who formed a band. Each band member adopts a superhero persona, and they wear matching superhero costumes. An Aquabats show will include bits where a supervillian will appear on stage for the team to banter with, and then fight, sometimes while they are playing a song. Musically they are influenced by Oingo Boingo and Devo. The band has had ups and downs, and a couple of hiatuses, but they have a cult following and keep finding ways to keep on rocking. At their height, the band had eight members. Currently that are at five. In total, 15 people have been members of the band at one time or another. With their superhero theme and theatrical nature, a television spin off seems natural. However, it took three tries for them to make it happen. The first attempt was in 1998, with a mini-pilot directed by Bobcat Goldthwait. Apparently it wasn’t very good, and even the Aquabats don’t want anyone to see it. They tried again a year later with a music video for their album Vs. the Floating Eye of Death that also acted as a set up for a series plot. Fox Family Channel expressed interest, and were in the process of ordering a pilot when they were bought by Disney, and the project fell by the wayside. While the band was on hiatus during 2004, band leader Glenn Jacobs became involved with television production. While the band was revving up again, one of his company’s pilots was picked up. The name of that show is Yo Gabba Gabba! You might have heard of it. With the success of that show, Jacobs was able to get some added exposure for the Aquabats by having them appear at times as musical guests. A new pilot was produced. Even then it took a few years to get the green light. Eventually, Kids’ Network “The Hub” picked up the show. The premise is not far from what I said at the beginning. 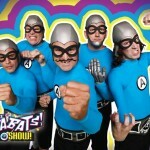 The Aquabats are a team of superheroes who also work as a rock band. They travel around in their mobile command center/ tour bus, the Battletram. The show is campy, but not in the old Batman show style; feeling more like the Sid and Marty Kroft live action kids shows from the 70s. The five current members of the band star in the show with each fleshing out his character more than in their stage show. All are presented as nice guys who want to help people, but have a bit of an underdog status. The MC Bat Commander (Glenn Jacobs): The team’s leader and lead singer. He is brave, but impulsive. He is also has complete confidence in everything he does, even when wading in without a plan. Although he is the only member who does not have superpowers, he is often the first to charge into battle. Crash McLarson (Chad Larson): The team’s muscle and bass player. Crash is an endearing man-child, who has the power to grow to 50 feet tall. Unfortunately he cannot control this power, only growing when becoming emotional. And it’s not just anger, any strong emotion will do. Once the Bat Commander got him to grow by pointing out how sad the situation they were in was. Eaglebones Falconhawk (Ian Fowler): The band’s guitarist. He is cockier than the rest of the team, and will at times strike out on his own. At first he had no powers, but uses a laser powered guitar as a weapon. After losing a battle with his archenemy and older brother Eagleclaw Falconhawk (Jon Heder), Eaglebones was visted by the spirit of the Sun (Lou Diamond Phillips), who gave him the power to summon a spirit animal (a female eagle named “The Dude”) and the power to see the unseen. After this, Eaglebones often acted as the voice of wisdom on the team. Ricky Fitness (Richard Falomir): The band’s drummer. As his name implies, he is in the best shape of the team, and tries to get the team to be healthier, being the only one to not indulge in junk food. He is also portrayed as a lady’s man, often flirting with female characters, even villains. He also has a phobia about getting dirty. His power is superspeed. Jimmy the Robot (James R Briggs Jr.): The band’s keyboardist. His name says it all – he is a very human-looking robot, with built in weapons, sensors, and detachable hands. He acts as the team’s scientist. He often feels lonely and worries that the team does not truly accept him because he is a robot. Each episode has four elements. First is the live action story that runs throughout the episode, which features the Aquabats facing some enemy with the conflict being resolved by the end of the episode. At some point during the episode, someone will come across a TV screen in an odd location and exclaim, “Look, it’s a cartoon.” At this point a short Aquabats cartoon will be shown. Unlike the main plot, the cartoon has a serialized plot that runs through the course of the season. There will be a second very short cartoon featuring the Aquabats mascot Lil’ Bat. Finally each episode will have a parody commercial for a useless product from a company called Gloopy. The guest stars are also often a treat. Besides Lou Diamond Phillips and Jon Heder, the show has included appearances by “Weird” Al Yankovic, and Samm Levine. Former Aquabats members Courtney Pollock and Boyd Terry appear as their superhero personas of Chainsaw and Catboy, but in non-Aquabat costumes. One very notable guest is Matt Chapman, who is one of series regular writers and directors. In one episode, he plays a ghost tormenting the team for disturbing his grave. More importantly he plays an evil carnival showman named Carl who looks and talks like Chapman’s character Strong Bad, from his site Homestar Runner. In the next season, the show will have appearances by Tony Hawk, as well as Mikey Way of “My Chemical Romance”. Mikey’s brother, Gerard Way, will direct this episode. So overall how is the show? Actually, it is really good. It knows what it is: a show aimed at kids, but with enough going on to entertain any adults willing to buy into its premise. The five leads are totally committed to their roles, and at no point seem embarrassed to be there. The guests also seem to enjoy themselves. The production is naturally cheap, befitting the show’s budget, but this is the kind of show that turns that into an advantage. If you are able to get past the show’s cheesiness, it is very enjoyable. Season 1 is currently available on Netflix. Season 2 will debut on The Hub on June 1st. I give The Aquabats! Supershow! a grade of B+.